In 2002, John Osborne won a competition on John Peel’s Radio 1 show, writing the slogan “Records you want to hear, played by a man who wants you to hear them”. For any John Peel fans, you can see why that particular slogan was a winner, as it pretty much said exactly what John Peel stood for. John Peel’s Shed is John’s story of not only how he won and what he won, but also a meander through John’s discovery and love of music and radio. John has performed this show at festivals and even for Radio 4, so we are very excited to welcome him to Deepdale Backpackers & Camping. You’ll hear John’s story, some of the obscure records he won, and some of his poetry. You’ll have a chance to chat to John during the evening. 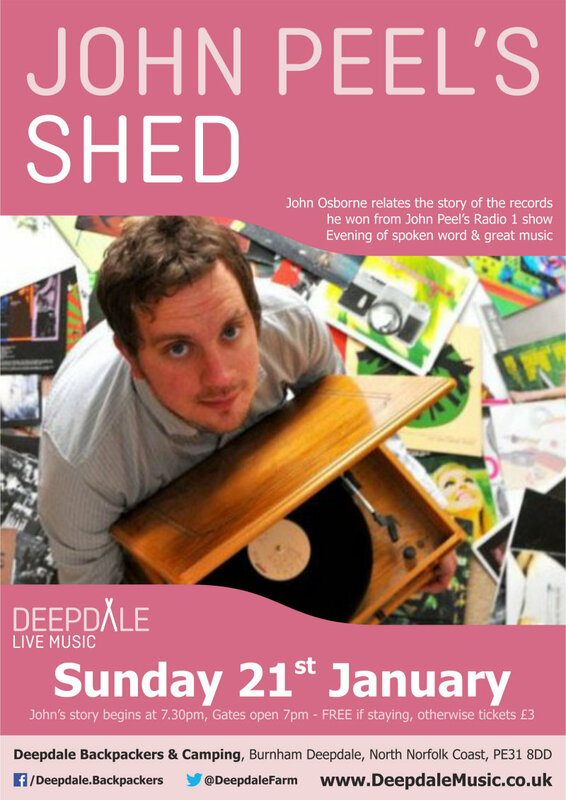 John Peel’s Shed - Sunday Session - To start 2018 we thought we’d offer something a little different in our Deepdale Music programme, spoken word about music. We are really pleased to welcome John Osborne, poet & story teller, to tell the story of the records he won from John Peel.